It’s Real Steel meets the Incredibles, and there’s not only fun action here, but a cool story with a clever mystery angle. 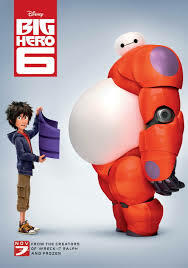 Big Hero 6 is a pretty fun movie from Disney animation. This one was not made by Pixar, but it sure looks like it was. The movie resembles The Incredibles more than anything else, as it eventually gets to a point where there’s a team of superheroes fighting a single villain. But for most of the movie it’s the story about a boy who lost his parents and has to invent something cool in order to get into the school of his dreams. When he does succeed with this and then his invention is stolen, he spends the rest of the movie trying to get it back and solve the mystery of why it all happened and who is behind it. The result might sometimes feel familiar, but it’s still pretty cool. Big Hero 6 is a light-hearted, but fast-paced movie from Disney animation. 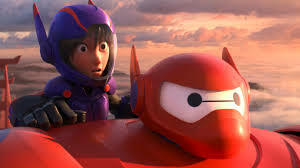 The guys who worked over at Pixar (which is under the Disney umbrella) have made this film from a Japanese comic book about a boy named Hero, who has lost his parents and is now trying to find himself. He’s lost in the world and figuring out who he’s supposed to be with a little guidance from his older brother. If that sounds cliched, it’s actually not. Hero gets involved in robots and technology the likes of which we have never really seen put on screen before. The result is something pretty cool. We begin the movie in the middle of a robot wars battle. Like Toy Story 2 which began with the characters in the midst of a Buzz Light Year video game, this film wastes no time with introductions. The robot fight is exciting and lively and by the end of it, Hero has defeated a big Russian guy and we have learned that bot fighting and betting on bot fighting may be illegal, but Hero doesn’t really care. He’s the kind of kid who does what he wants and doesn’t let himself get bullied. He’s also got this cool invention called microbots which come together and separate at will to make up his robot. It’s a fantastic opening that goes from action to action as the robot battle ends and a motorcycle chase begins. Hero is confronted by the Russian and his goons, after the fight, and Hero’s brother, Tadashi swoops in to rescue Hero and take him on the chase. The only negative about all of this is that Hero finds himself behind bars, being arrested. Just recently another movie came out for kids (also by Disney) called Tomorrowland, and at the start of the movie the protagonist kid is doing something illegal and is arrested. Now, as a movie, these concepts are kind of cool, but in terms of a message, what are we telling our kids? That these characters are awesome because they are rebellious and do what they want and end up getting arrested? I could see someone making the other argument too though, that these characters start the movie off in prison, but during the course of the film change and become better people who would never find themselves in that kind of situation again. So there are definitely two ways to look at the argument. I just don’t like that when we introduce the characters, we are introducing them as these cool kids that we want the kids watching to relate to, and then we throw them in prison. Hero doesn’t like the idea of going into this science academy, even just for a visit. he makes fun of his brother, calling it a nerd school, but as soon as he sets foot in one of the lab rooms, everything changes. Suddenly Hero is surrounded by young people doing some very cool things with science. There’s a girl who uses electromagnetic fields to connect the wheels of her motorcycle, like razor sharp saw blades flying through the air. Then there’s a girl who takes a ball and turns it into a blue powder-like physical form. When she hits a button, the whole thing suddenly blows up in the air. There’s also a guy named Wasabi (voiced by Damon Wayans Jr. of the TV show The New Girl), who is working with invisible lasers. He uses them to create a sort of force-field wall, where if something is thrown into it, then the lasers cut that something apart into little tiny pieces. There’s even a guy named Fred (Silicon Valley’s T.J. Miller,) who has no super powers or scientific ability at all, but is simply the school mascot, going around in a dragon outfit and talking up all these ideas for inventions that he thinks his friends should find a way to make. When Hero sees what his brother is working on, he is especially impressed. Tadashi has an inflatable medical robot named Baymax, as his invention. This robot can scan you, figure out what’s wrong, and provide the spray solution all within a matter of seconds. When Hero leaves the school that night, he has already made up his mind. He has to go there. Which means he has to come up with an amazing invention and wow the head of the school, Robert Callaghan (James Cromwell.) Hero gets to work and it takes him a while to come up with something, but eventually the microbots (the pieces that made up his robot fighter earlier on), become his invention. On their own, each one can barely do a thing, but when linked up together, the microbots are near invincible. Hero wins the competition and gets accepted to the school, but then there is a massive fire at the university while Callaghan is still inside. Tadashi goes running in to save the old man, but he ends up becoming a victim of the fire as well. There’s a huge explosion right after Tadashi runs in, and suddenly Hero has lost another family member. This is some really sad stuff. It’s on the same level of heart-tugging as Up, when the old man lost his wife. Only here, Hero is just a boy and he has already lost both of his parents. Hero stays to himself at home for a while, wanting to be left alone. He misses the start of school at the university, and it isn’t until he accidentally activates Baymax, that he finds any new happiness. Baymax does two important things for Hero. He contacts all of Hero’s friends (really, the brother’s friends, from the university), telling them that Hero needs them for support. The second thing Baymax does is he discovers that the single microbot Hero has left is moving. That means it is being pulled toward other microbots and that they haven’t all been destroyed in the fire, like Hero thought. When Hero and Baymax follow the single microbot to an abandoned factory and meet a masked villain who is controlling tons of these microbots, Hero knows it’s time to accept his friend’s help. He rounds them all up and starts making costumes for them based on their cool inventions. They suddenly become a team of superheroes. Each one has some amazing ability and skill and I love the montage scenes that really show off their individual powers. There’s one, for example, where the butler wears the mask of the villain and they all take turns using their special skills to get the mask off of him. In real life, the mask is what the villain is using to control these microbots, so if they can get the mask off of him, then they can defeat him. The movie has the usual twist ending (usual for these days, anyway), and I like the way it uses old video footage of things from the past to find the bad guy out. Monster’s Inc did something similar, also towards the end. But then there’s a final wrinkle in the storyline that feels pretty forced as a character is rescued who we didn’t even really know was in trouble to being with. Sure it makes for an extra happy ending, but it was just kind of unnecessary. Other than that, and the opening with the kid going to prison, nearly everything in the movie works. It’s Real Steel as an animated film that turns into a superhero movie. When you combine the best of both worlds, you are sure to have success.